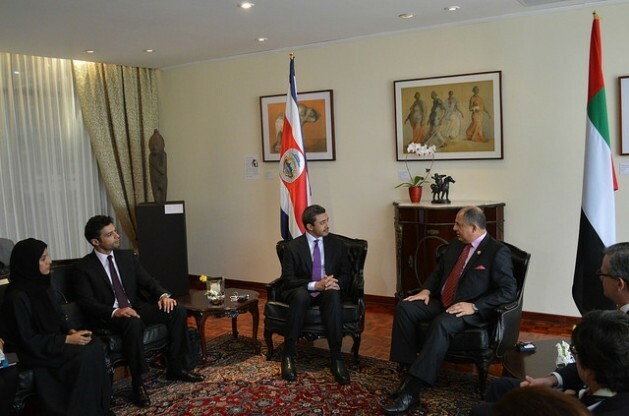 SAN JOSE, Feb 12 2016 (IPS) - A visit by United Arab Emirates Foreign Minister Sheikh Abdullah bin Zayed Al Nahyan to Costa Rica paved the way for closer trade ties between the two countries, especially in the areas of tourism and sustainable energy. 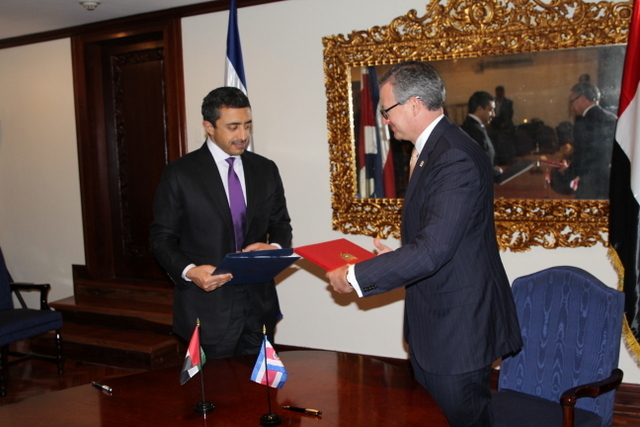 During the first official visit ever to this Central American nation by a UAE foreign minister, Al Nahyan and his Costa Rican counterpart and host, Manuel González, signed two agreements. One of them refers to air services, and will boost visits by Emirati tourists to Costa Rica. They also agreed to immediately begin the process of negotiating and promoting investment in tourism. “This agreement opens up opportunities to take better advantage of air services between the two countries,” Al Nahyan said in Costa Rica’s presidential palace, after an official meeting with this country’s president, Luis Guillermo Solis, at the start of his one-day visit to San José on Friday Feb. 12. He was referring to the new Emirates airlines route that will begin to operate on Mar. 31 as the world’s longest flight – nearly 18 hours – according to the company. “We have a lot of work to do with my colleague, Costa Rica’s foreign minister, to talk to the airlines and make sure things work out,” he said. “Emirates will fly from Dubai to Panama; this strengthens potential ties, not only between the UAE and Panama but with the entire Central American region, and particularly Costa Rica,” Foreign Minister González told IPS in an exclusive conversation about the visit. The other agreement signed on Friday afternoon in Costa Rica’s Foreign Ministry provides a framework for cooperation, accompanied by a mechanism for formalising bilateral political consultations, which will facilitate diplomatic relations between the federation of seven emirates and this Central American nation. Costa Rica was the fourth and last country on Al Nahyan’s official Latin America tour, which began Feb. 4 in Argentina before taking him to Colombia and Panama. The Emirati minister said a key area of cooperation between the two countries would be energy, where both countries are pioneers in complementary niches. “I know Costa Rica wants and plans to use more renewable energy, and I know they have done a great deal in terms of legislating to strengthen that sector,” he said. This country does not depend on fossil fuels for electricity, because 97 percent of its electric power comes from renewable sources. But the use of fossil fuels in transportation means they still represent around 80 percent of the total energy mix. The UAE has committed nearly 840 million dollars to help other countries of the developing South produce clean energy. “That’s why we’re in Costa Rica: to see what has been done in this area, and to create a legal foundation with respect to how we can cooperate,” Al Nahyan said in the news briefing. Solís, of the centre-left Citizen Action Party, said the UAE invited this country to take part in an annual energy conference held early in the year in the Gulf nation. “Costa Rica will be represented there with the highest-level technical teams, precisely to seek opportunities for cooperation in energy,” the president said. The Emirati minister also stressed that “like Costa Rica, we recognise that turning to clean energies is the most promising solution. The United Arab Emirates has been a major investor in clean energy sources for many years, both within the country and abroad. “Costa Rica has been one of the most ambitious and progressive-thinking countries in the issues of climate change and sustainable development at the international level,” the minister concluded in his article. Minister González explained in his dialogue with IPS that there are three major areas where his country and the UAE find points in common: human rights, the fight against climate change, and the struggle against people trafficking and in favour of associated labour rights. This new openness and their traditional leadership in renewable energy “opens up opportunities for Costa Rica, which does not depend on oil and gas,” González said. González said his guest “has expressed interest in Latin America, as demonstrated by this tour,” and noted that he was one of the promoters of the Global Forum on the Relationships between the Arab World, Latin America and the Caribbean Region. “I met with him in the context of the United Nations General Assembly, in September of last year, and suggested that he consider making a visit to the region, and specifically to Costa Rica,” González added. Costa Rica has consulates in Lebanon and Jordan and an embassy in Qatar. But it does not yet have a consulate or embassy in the UAE. “We hope to boost to their maximum expression our relations with the Arab world,” González said.